Flashlight Tours are back… with a twist. First, you will need to be 21 or older to be on the tour. This is not a tour for kids. 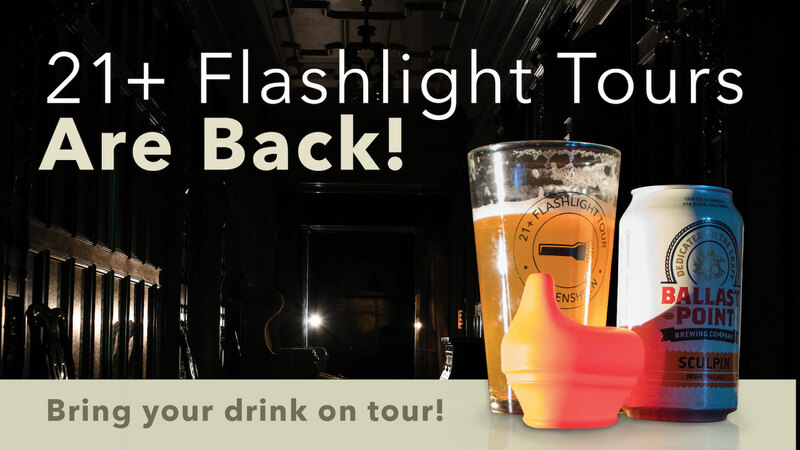 As part of your cost for admission, guests will receive a branded Glensheen Flashlight Tour pint glass with… a sippy cup cover. The cover allows you to bring your glass and alcoholic beverage INSIDE the mansion. What else is new? The addition of Glensheen’s newest space available to the public for tour – The Carriage House Living Room. Here, guests will enjoy the warmth of a live fire – the only working fireplace on the estate. Inside the mansion, all the lights have been turned off. Each group is accompanied by two guides who will illuminate pieces throughout the house, which allows you to appreciate our rare collection in a new way. Guests on the 21+ Flashlight Tour will see the lower level, first floor, and second floor of the mansion. Due to the nature of this tour, patrons must be 21 years of age or older. Any intoxicated patrons will be refused admission with no refund. Glensheen requests that guests do not bring their own flashlights.